A CO2 Scrubber removes carbon dioxide from the air. Although large scale CO2 scrubbers remain largely in the theoretical and planning stages of development, many environmentalists and scientists question the usefulness of this technology. While there are many prototypes of CO2 scrubbers, most use similar technology to remove carbon dioxide from the air. Although the technology to create the CO2 scrubber is advanced, the function of the machine is easy to follow. Air polluted with carbon dioxide is pumped into the CO2 scrubber. The air comes into contact with an ion exchange resin, which attracts the carbon dioxide molecules. The cleaned air is then pumped out of the CO2 scrubber. The ion exchange resin must be cleaned periodically to retain its usefulness. Currently, humid air is used to remove the carbon from the scrubber. The carbon must then be discarded or reused. One possible use is to pump the collected carbon dioxide into a greenhouse to encourage quicker plant growth. Other scientists see potential in growing algae with the collected carbon, which could then be used as food or fertilizer. There are several advantages of the CO2 scrubber that makes many people interested in further developing the technology. A CO2 scrubber can help protect the economy by diminishing the need to reduce the use of fossil fuels, which remain less expensive than renewable and alternative energy sources. Finding ways to reduce carbon in the atmosphere, some argue, is simply pragmatic, because most consumers and corporations are not willing to reject fossil fuel use. 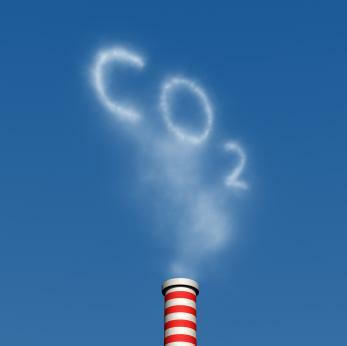 Using a CO2 scrubber will reduce the amount of greenhouse gases that lead to global warming. It is estimated that the amount of carbon in the atmosphere is nearly 40 percent higher than before the Industrial Revolution, so some environmentalists argue that scrubber technologies are needed regardless of advances in alternative energy sources. While the CO2 scrubber help resolve some short term environmental problems, many environmentalists are concerned that embracing this technology will just allow consumers to disregard the need to develop alternative energy sources. They argue that consumers and government agencies should be seeking ways to permanently diminish the use of fossil fuel and carbon emissions, not reduce the harmful side affects of this consumerism. In general, these groups argue people should be interested in ways to save energy, not ways to reduce the impact of rampant consumerism. Other technologies such as carbon sequestration and carbon capture have also been rejected by many environmental groups for the same reason. These groups argue that controlling carbon emissions still does not address other problems inherent in fossil fuel use. These problems, such as a dwindling supply and ecosystem pollution, would not be resolved through CO2 scrubber or other carbon technologies. Instead, they argue, scientists should be using solar power to decrease global warming and other renewable technologies. The CO2 scrubber is also currently too expensive for widespread use. While scientists argue that the benefits of reducing carbon dioxide in the air more than compensates for the technology's currently high price, it is unclear who would purchase the machines. Some think that money gained from carbon credits could be used. There is also some question as to the environmental impact of the CO2 scrubber. Collecting one ton of carbon dioxide is only equivalent to a single plane flight from London to New York. This means that millions of units may have to be made in order for a significant change to occur. There is also some debate as to how to dispose of the carbon that is collected in the scrubber. While it is difficult to determine whether or not the CO2 scrubber will achieve widespread use, such technologies could be useful in reducing the carbon already in the atmosphere. Fossil fuels are an increasingly finite resource. In addition to the development of CO2 development technologies, the development of a range of alternative energy sources will help to ensure a better future for our planet.